SWIM IRELAND MASTERS are proud to present a Master’s Relay Meet plus Training Day to be held on Saturday 30th April 2016. A draft programme of the relays and training session is attached. The early bird entry fee is €5.00 per individual and the closing date for receipt of entries is Thursday 21st April 2016. Relay team entries are free of charge but all relay participants must submit an individual entry by Thursday 21st April 2016 to avail of the early bird fee. We don’t need payment up front but we do need to know if you are attending and entering teams so we need your entry forms before 21st April. DON’T send payment but pay on the day. The organised training sets will be led by a guest coach (TBC). There will be no medals issued but Irish and Regional relay records can be claimed. The novelty relay will be open to all individual entrants and teams will be drawn by lots. Well done to all who have made the list. Next on the cards is the Kingdom Masters Gala in Tralee. Please note: Warm Up 9.30am and Start 10.30am for Session 1. On Friday 27th May 2016, Swim Ireland will present our sixth annual awards evening. We are delighted to announce that the Awards will take place in the iconic Titanic Suite at the Titanic Centre in Belfast. The 2016 Awards night will celebrate and honour the fantastic work and the outstanding accomplishments of our athletes, coaches and volunteers throughout the year and we will induct a deserving member of the aquatic community into the Swim Ireland Hall of Fame. Nominations are now OPEN for the 2016 Awards and we would like to encourage all clubs to put forward their deserving members across all categories. We will accept nominations to Friday 15th April 2016. Click here to nominate now. All members of the aquatic community are invited to purchase tickets at a cost of €55(£45) by ordering ticket(s) from the Swim Ireland online shop or by calling the Swim Ireland office on (01) 6251138. Events : All events will be run as Heat Declared Winner events. Swimmers will be seeded according to their entry times but results will be categorised into their age groups. All individual events will be Mixed events but results posted will be as Male and Female with the exception of the Mixed Relay. *Event 22 – Mixed 1500m Freestyle will be limited to 2 heats – entries will be accepted on a First Come First Served basis – we cannot accept NTs for this event. The European Masters are now requesting you choose 3 events. If you have more than 3 and do not make a decision by the 15th of March then they will choose 3 for you?? See below. Great swimming done in Limerick at the weekend by all accounts. Loads of records being broken. Results attached. 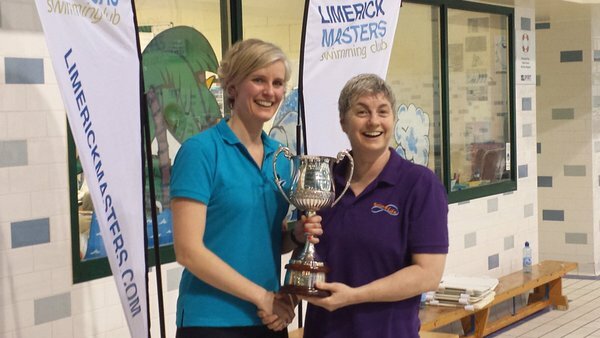 Well done to Dymphna Morris, Swim4Life, at Irish Open Masters Championships who achieved records in the 800m & 1500m FC. Limerick will start earlier than planned! Warm up will be from 7.45 to 8.25. First Heat of the 400m freestyle will commence at 08.30. The Sundays Well Masters Gala was held in the Gus Healy Pool, Douglas on Saturday 20th February 2016. A great buzz was evident around the pool, as the thrill of competition crept up on all the entrants, and the atmosphere was electric from the onset. SWSC Masters as the host club had a very strong team of 52 members competing on the day. There was a large competitive entry from Cork Masters, with near neighbors Mallow Masters, Cork Tri Club, Brookfield Masters and Sandycove SC also entering teams on the day. Masters, Aer Lingus, NAC, Dublin SC, Swim4life, Killarney, Kingdom Masters and Galway Bay Clubs. We were particularly pleased with the strong entries from the Dublin clubs, and Lisburn City SC in the North, all travelling the long distance to compete in the premier Masters event in Cork. We had a number of Munster & National records broken today – These records are currently going through the application process and will be verified by Swim Ireland Masters in due course. There were some great individual swims on the day – too many to mention but particular note must go to the team relay events, which appropriately took place at the end of the gala. Sundays Well Masters won the Men’s 159-200 yrs. 200mts medley relay with Denis Galland, Tommy Lee, Joe McAvoy and Tom Lynch blitzing home to pip Cork Masters at the post in a thrilling finish to kick-start the relay events! Sandycove Masters won their age group in the women’s 400mts Freestyle Relay in a great time of 4.15.18 with the Cashell sisters in great form in this event! Clonmel Masters won their relay age group in the female 200 free also – a great result for them in a very competitive event! The day was topped off with the mixed Canon relay event, (where the fastest men and women in each age group form one team together), with a hugely competitive & exciting final, resulting in a scintillating win by Cork Masters ahead of Sundays Well. Finally, an eclectic group, comprising of all the clubs and competitors, retired to the South County Bar in Douglas for the famous SWSC Masters relay prize giving ceremony, where a great night was had by all! A fitting end to a great day of competition. We look forward to all your support again next year – onwards and upwards for the SWSC Masters!! Limerick Masters Gala is fast approaching and the first event is off on Friday evening with the 1500m FC. Saturday morning starts early with the 400m FC. I have attached the program for your perusal. Will post updates and results on receiving them.